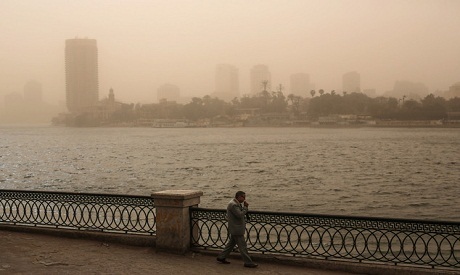 The head of Egypt's Meteorological Authority Ahmed Abdel-Aal said that the unseasonable current heat wave is expected to reach its peak on Friday, with sandstorms arriving from the west expected to hit several parts of the country. Egypt has been facing an intense heat wave since Monday, with temperatures reaching a high of 36 degrees in Cairo on Thursday. On Wednesday, Cairo registered a high of 32 and a low of 18, while Alexandria registered a high of 28 and low of 12. On Friday, Cairo will see a high of 38 and a low of 17, while Alexandria on the Mediterranean will experience a high of 24 and a low of 16. The Red Sea governorates are expected to see a high of 32 and a low of 23. Upper Egypt's Luxor will register a high of 41 and a low of 23. Aswan will experience a 42 high and 27 low. "The heat wave is set to break on Saturday with a drop of more than 10 degrees Celsius, with rain expected to fall on the country's coasts," Abdel-Aal added. On Saturday, Cairo temperatures will register 23 at high, 17 at low; Alexandria will experience 21 at high, 17 at low.